A WOMAN was rescued from a burning house last night after fire crews spent more than an hour battling to control the blaze. The property on Prestonfield Road, Edinburgh, was engulfed in flames at around 8.50pm, with worried neighbours telling emergency services they feared someone may still be inside the building. Four fire crews from across the city arrived at the incident, using one height appliance, six breathing apparatus and two high-pressure hose reels as they worked to control the blaze. 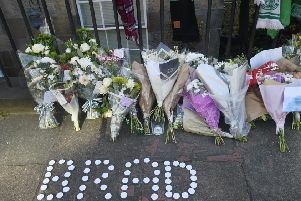 A 22-year-old woman was taken from the house and given oxygen therapy on the scene, before being transferred to the Edinburgh Royal Infirmary for further treatment. It is understood she was suffering from smoke inhalation and a small burn to her left forearm. A spokesman for the Scottish Fire and Rescue Service said the flames had been extinguished by 10.13pm, and that no one else was injured in the incident.